My journey with breast cancer started one month after my 30th birthday. I was a single mother with a 15 month old little boy. My diagnosis was absolutely devastating as it is I am sure for every woman. I couldn’t understand why God gave me this sweet little boy if He knew I would be diagnosed with breast cancer. 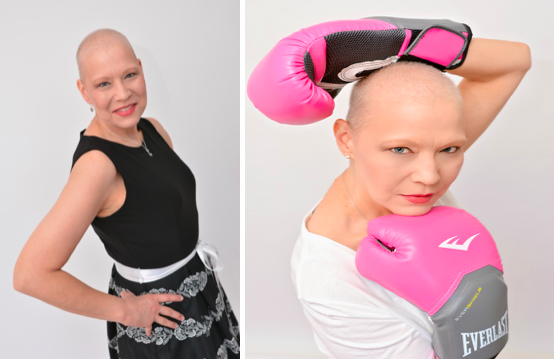 After a mastectomy and 4 grueling rounds of chemotherapy, the reason was clear. I probably would not have fought for my life like I did. The day before his eighth birthday, I found out that I had relapsed. It was at Christmas time and I vividly remember him telling Santa Claus that all he wanted for Christmas was for my cancer to go away. After a partial mastectomy and six weeks of radiation, I had a prophylactic right mastectomy. I knew my son understood that I was sick, but he had no concept of the gravity of the situation. I rallied again, except this time it was a little harder because I could see the toll it was taking on my son and how he wanted to be the one to take care of me. We made it through it and along the way, I encountered other health issues and obstacles. One of those obstacles was a probable head and neck tumor on my fifth cervical vertebrae nerve that they felt might have been caused by radiation therapy for my breast cancer. After surgery, I wanted my son to be the one to tell me when I woke up whether it was cancer or not. It was not, and we celebrated. The day came for his high school graduation, a day I never thought I would get to witness. It was one of the happiest days of my life. The January preceding his graduation, I had my regular oncology check up and scans which we had been doing for two years due to changes after a horrible car accident and injuries sustained in that accident. The subtle thickening in my lung pleural spaces had gotten worse and now the scans showed it was on the left as well. Subsequent tests such as a bone scan , bronchoscopy, and PET scan were all normal. I celebrated for a while until I couldn’t get rid of the feeling deep down in my gut that I needed to push for a definitive answer. That definitive answer would come in the form of a lung biopsy. That procedure meant a chest tube, a hospital stay, and waiting for an answer, but I needed an answer. My answer came the morning after my biopsy when the surgeon came in to check on me. “I’m sorry, but I am afraid it is what we feared. It is cancer.” I froze. I was a little relieved to have an answer but scared to death at what this diagnosis would bring. It was at my first oncology appointment following the biopsy they told me that it was Stage 4 Metastatic cancer and that I could never be cured. Those words were hard to hear. The plan was for me to quickly begin 6 months of weekly chemotherapy. The weekend before my first treatment, I moved my son to college for his first semester at Texas A&M. I know it was important for him to go on with his life and not to put it on hold for me. The first three months of treatment were the worst, wondering if it was working or was I wasting precious time with something that wasn’t going to make a difference. The scans showed it was working but how much we were unsure. My cancer was so hard to see to begin with and also on the surface of my lung. It wasn’t like it was a tumor we could watch shrink. None the less, I was grateful and blessed. At the conclusion of my IV chemo, I began daily maintenance treatment with Femara and Ibrance. My additional follow up scans still show “something” is there. We won’t know if it is cancer or scar tissue unless we do a biopsy, but this would be dangerous. No progression would be good news. I now have a new spot on a rib in the location of the densest part of my cancer, but again too risky to biopsy. At this point we wait, watch, and do scans. The longer I can stay on my current regimen, the better my prognosis is for length of survival. I choose to believe God isn’t done with me yet. My experience has helped me to make such a difference as a pediatric nurse in the lives of the children I work with every day. I have lost many friends to cancer and have always thought of it as survivor guilt being one of those to survive. Now, I feel like it is more survivor responsibility to help others through my own journey and experience. I have never had to ask for help from Komen because I have been blessed with good health insurance, but I have friends who would not have gotten what they needed without it. I have been impacted through Komen by the walk and the 3 Day. I might be living with Stage 4 cancer but I am not alone.